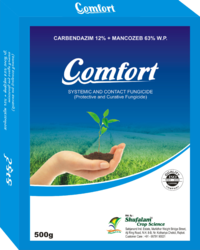 Our product range includes a wide range of hexaconozole fungicide, tebuconazole 25.9% ec, carbendazim 12% mancozeb 63% wp, mancozeb 75% wp, sulphur 80% wdg and tricyclazole 75% wp. We are the manufacturer of the Hexaconozole Fungicide. 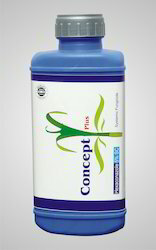 Application : Concept is used for formulation of Hexaconazole, which is used for the control of sheath blight of rice and powdery mildew of mango. Application : Tebuconazole 25.9% EC is a systemic fungicide containing 25.9% m.m. Tebuconazole Technical as active ingredient balance auxillaries and inert material. 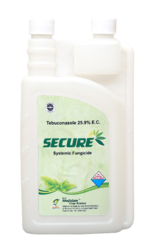 Tebuconazole 25.9% EC is used as foliar spray for the control of powdery mildew and fruit root of chilli , tikka and rust of groundnut, blast and sheath blight of rice. Composition : Carbendazim 12% + Mancozeb 63% W.P. 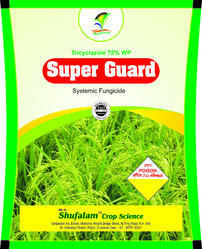 Application : It is recommended for control of blast disease of paddy and leaf spot and rust diseases of groundnut. Application : It is effective against a variety of diseases of different vegetables, fruits and cereal crops as well as seed borne diseases. Packing : 1 Kg., 500 gm. Application : Sulphur 80% WDG is used for the control of powdery mildew and scab on Grapes, Cowpea, Guar, Pea, Cumin, Apple & Mango. Scab disease of apple. It is dry flow able water dispersable granules containing Sulphur 80% w/w balance ingredients, the particle size range from 2 to 6 microns, thus displaying a fine layer of active ingredient on sprayed crop resulting enhanced efficacy. Composition : Tricyclazole 75% W.P. 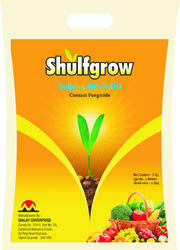 Dosage : 25gm / 15 Ltr water Application :Recommended for the control of blast disease of rice crop. 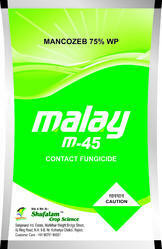 We are the manufacturer of the Fungicides. 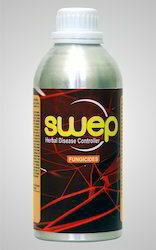 Application : Swep is very effective fungicide used to early blight of tomato and potato, blight of cumin, downy mildew, leaf spots, anthracnose of verious crop like Cucurbita (Melon, water melon, spuash cucumber), Solanceous crops (tomato, eggplant), Strawberry, Rose, Grapevine.